Around Karachi, India, the country was gray and flat, studded with low lying sage-brush that made way for the Great Sind Desert which ran down to the sea. It was a dusty, lonely place and the incalculable vastness of the desert was everywhere, stretching with barren savagery west into the Arabian Sea and east into India. To the north, the ranging sands of the desert were broken by jutting stratas of sandstone, heaved into hog-backed ridges that looked like armies of stone marching towards the sea. At Karachi was one vestige of Western civilization. A huge, black dirigible hanger stood towering above the heat haze, keeping an endless vigil for a ship that would never come in. The ill-fated R-101 British dirigible, destined for Karachi, had crashed and burned in France on its maiden voyage to India. Since then, the great hanger stood empty and useless with nothing but wind and "sand to fill its great cavern. Early in the spring of 1942, a group of men came to camp within its shelter. The time then was the early days of World War II. In the chaos of conflict, the 51st Fighter Group of the United States Army Air Corps became the first American fighter group to reach India after the initial Japanese attacks on the United States and its possessions. An unexpected chain of events had caused them to land in India. Colonel Homer L. Sanders was a tall, lean, ardent man in whom the forces of energy were never still. When the United States became involved in the war, Sanders clamored, begged and pleaded with the higher command to send him and his 51st Fighter Group overseas. 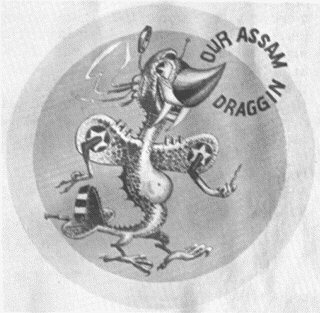 The wish was granted and in later years of foreign service, the enlisted men of the group overseas who were enduring particularly difficult times would sometimes say with sarcastic delight, "We went to hell with Homer L."
The 51st Fighter Group and every man in it had been volunteered to take up the battle with the Japanese. It was accepted on January 12, 1942. As the fog dissipated from San Francisco Bay, the men sailed out to sea aboard the S. S. Coolidge with lock, stock and barrel primed for war. The route of travel changed after they reached Melbourne, Australia. Originally the pilots were to fly their fighter planes from Melbourne to Brisbane and then to Darwin. From there they were to fly across the Timor Sea to the island of Timor, hop to Bali and finally to Java. Captain Grant Mahoney led a flight of 12 P-40s of the 35th Fighter Group across that route successfully and those ships were destined to be the only reenforce-ments ever to each Java. The ground personnel of the 51st and a few remaining men of the 35th Group were to proceed by boat to Java, but under the new plan of strategy a convoy of ships was formed in Melbourne to carry all of the personnel and equipment to Fremantle on the southwest coast of Australia. The convoy leaving Melbourne consisted of three troop transports, a cruiser which was the U.S.S. Phoenix, and two destroyers. On the transports the Holbrook carried the 25th, 26th and Headquarters and Headquarters Squadrons of the 51st Fighter Group. Also on board was part of the 51st Service Group. The Duntroon, a twin-screw motor vessel formerly used as an interisland steamer, carried the 16th Squadron of the 51st Group; Headquarters Squadron of the 35th Group; and the 35th Interceptor Squadron. The third troop carrier in the convoy was a Dutch interisland vessel, the Katoomba, which carried the remainder of the 51st Service Group-three squadrons of men. When the convoy steamed into the harbor at Fremantle, the men were granted shore leave. The city of Perth was only 10 miles distant from the harbor and in Perth, the officers and enlisted men received the same warm welcome as they had in Melbourne. At midnight on the last evening ashore the streets of Perth were blocked off and the P-40 fighter planes, which had been flown across Australia from Melbourne, were towed through the city and down the last 10 miles to the docks. During the night the planes were loaded aboard the aircraft carrier, Langley, and on the following morning the convoy of ships put out to sea. The date was February 21,1942, and as they departed Australia the officers and enlisted men of the 51st Fighter Group had little knowledge of their destination. In the three months previous to that time the Japanese had thrust in all directions with unhampered fury. December of 1941 saw the last foothold in the Philippines, Davao on the island of Mindanao, fall in defeat. In January the Japanese sent their advancing hordes into New Guinea, New Britain and New Ireland. On January 10, Northern Borneo and the Celebes were attacked and taken; Southern Borneo and the island of Sumatra fell by February 1. The island of Timor followed on February 20, and Bali on the 24th. Nothing was left uncaptured in the island group north of Australia except Java which was then encircled. The convoy sailed toward that inferno of war north of Australia, and after they were at sea the men of the Fighter Group learned they were headed for Java. The aircraft carrier, Langley; the S. S. Seawitch, a cargo vessel; the Holbrook; the Duntroon; the Dutch Island steamer, Katoomba; the cruiser Phoenix and two destroyers proceeded with full speed ahead to carry aid to the intrepid forces of the little Dutch Army and the few remaining elements of the United States Air Corps, which were making a desperate last stand on Java. At noon on the fourth day at sea, the convoy was north of the Coco Islands about two days from Java. On that day the commander of the convoy decided that it was too risky to try to get troops into Java because the battle was not going well and the island might be captured at any time. The convoy was disbanded. The Langley and the Seawitch were to attempt to land fighter planes on the island to help relieve the critical situation, and the rest of the ships were to turn away and seek a safe port. On the following day, February 25, while Langley was attempting to reach Tjilatjap, a Japanese reconnaissance plane spotted the ship and directed dive bombers to attack. The aircraft carrier was sunk. In another attack, the S. S. Seawitch was badly damaged. Survivors of the Langley were picked up by a U. S. oiler, the Pecos. It was sunk a day later while transferring the survivors over to two U. S. destroyers, which were on the lee side of the Christmas Islands. Only a few survivors of the Pecos and Langley were found and taken to Australia. The Seawitch, listing heavily, managed to reach Melbourne thirty days later. "My father was a mate (merchant marine officer) on the Sea Witch at this time and, although they had some close calls (and were "fantastically lucky" as another historian has noted), the ship completed the voyage to Java carrying the P40's unscathed, and was escorted back to Australia by the Asiatic Fleets alternate flagship, USS Isabel (PY-10) without damage." On February 28 the last two defended cities, Batavia and Soerabaja on the north side of Java, were captured. From the southern port of Tjilatjap, a few Dutch ships loaded with refugees and Dutch Army personnel fled for Australia. Japanese bombers were then roaring from Bali to Tjilatjap and Sumatra. Java was doomed. Major General Brereton moved his air headquarters from the Philippines to Java, along with the remnants of the famous 19th Bombardment Group. They held out on Java until the last hour when defeat or capture was inevitable. In battle scarred B-17 bombers they escaped to Colombo, Ceylon, landing there on March 6. Meanwhile the three troop ships, Holbrook, Duntroon and Katoomba, had arrived in Ceylon. The harbor of Colombo was crowded with 195 vessels that had come there in escape from Singapore, the Philippines and Java. Parts of them were remnants of the Dutch navy and vessels of the British Far Eastern Fleet. In that congested harbor the three ships carrying the 51st Fighter Group, remained one day for fueling and then sailed for India. Colonel Sanders and the captain of the Duntroon had conferred many long hours. Their decision had been to proceed to a port safe enough to land the group where they could become useful and active. Their decision was timely. Had they remained, they would have seen the bellies of Japanese bombers which sank most of the ships remaining in the harbor a few days later. The Duntroon reached Karachi, India, on the night of March 11, 1942. The Holbrook and the Katoomba reached the same port on the following day. There the 51st Fighter Group disembarked, completing a journey of fifty-nine days at sea. Most of the group's equipment and airplanes went down with the Langley as did many pilots, crew chiefs and armorers. Pouring out on the docks at Karachi, the men lined up and marched through the city and out to the windswept hanger in the Great Sind Desert. The desert was vast and quiet. The heat rose off with stifling intense waves. The enlisted men placed their beds in the shelter of the R-101 hanger while the officers borrowed British desert tents and set up a camp on the outside. They lacked equipment and supplies but they got word to the United States War Department that they were still alive and awaiting further orders. 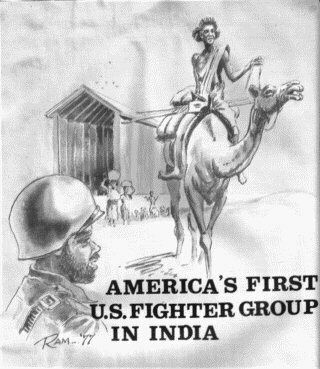 Thus began the existence of the First American Fighter Group in India. This group of men were destined to be - along with remnants of the Flying Tigers - the beginning of the 14th Air Force in China and the Initial Security Force which established and maintained the air supply line over "the Hump" from India to China. "Know that our time will come to rise on the morning wind, and if we live we shall come back again and if we die we shall go on fighting and our fame shall resound beyond the world."